Register on the ACM-DC Meetup event page. The Washington DC Chapter of ACM SIGGRAPH is proud to present Joey Ponthieux, EMMY award winning professional 3D animator and concept visualization artist at NASA. Mr. Ponthieux will delve into where, and how, art and science intersect as well as what it means to be an artist or a scientist. He will explore the fine line that separates art and science, how we perceive this separation, issues of convergence between art and science, and convergence as a matter of creativity. Please join us on Thursday, May 18, 2017 from 7pm to 9pm at the Torpedo Factory Art Center as we explore the worlds of art and science with Joey Ponthieux. Joey Ponthieux is a professional 3D animator and concept visualization artist. With a career that began in analog graphics production for offset lithography, he is an EMMY® award winning artist with 30 years of CGI production experience in the areas of Higher Education, Broadcast News, and Aerospace Research. He is currently employed by Science Systems and Applications Inc., and assigned to provide advanced computer graphics support for the Aeronautics Research Directorate at NASA Langley Research Center. Beginning or Advancing Your Tech Comm Career through continuous learning, webinars, conferences, etc. Thursday, March 24, 12:00pm to 1:00pm on the GMU Fairfax campus in Johnson Center Meeting Room B. Coffee and Light Refreshments Provided. 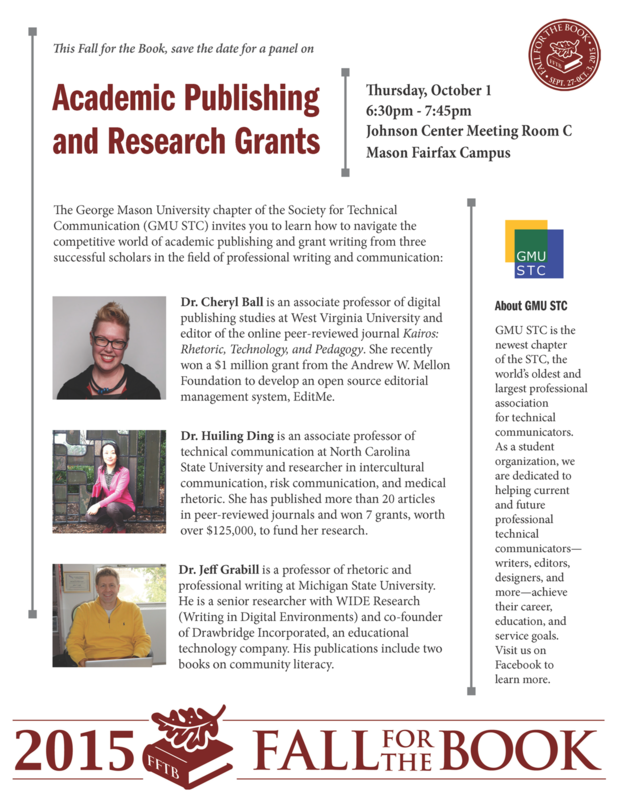 Dr. Cheryl Ball is an associate professor of digital publishing studies at West Virginia University and editor of the online peer-reviewed journal Kairos: Rhetoric, Technology, and Pedagogy. She recently won a $1 million grant from the Andrew W. Mellon Foundation to develop an open source editorial management system, EditMe. Dr. Huiling Ding is an associate professor of technical communication at North Carolina State University and researcher in intercultural communication, risk communication, and medical rhetoric. She has published more than 20 articles in peer-reviewed journals and won 7 grants, worth over $125,000, to fund her research. Dr. Jeff Grabill is a professor of rhetoric and professional writing at Michigan State University. He is a senior researcher with WIDE Research (Writing in Digital Environments) and co-founder of Drawbridge Incorporated, an educational technology company. His publications include two books on community literacy. Download the FFTB Save-the-Date flyer as a pdf. Read about the event and see the complete schedule on the Fall For The Book website. 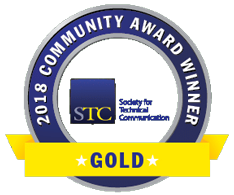 GMU STC is the newest chapter of the STC, the world’s oldest and largest professional association for technical communicators. 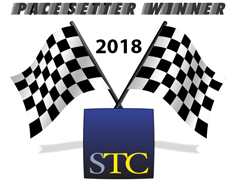 As a student organization, GMU STC is dedicated to helping current and future professional technical communicators—writers, editors, designers, and more—achieve their career, education, and service goals. Visit GMU STC on Facebook to learn more.